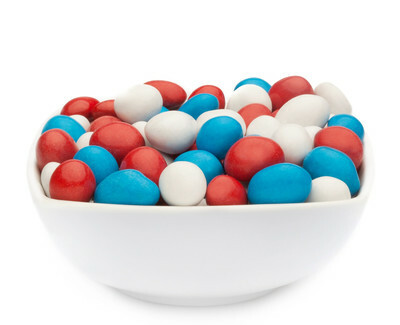 Peanuts in whole milk chocolate and white, red and blue sugar coating. MILK chocolate (sugar, cocoa mass, whole MILK powder, cocoa BUTTER, WHEY powder, emulsifier: E322, natural vanilla flavor), sugar, PEANUTS, thickener: E414, palm oil, tapioca dextrin, colors: E101, E120, E133, E160a, E171, glazing agent: E901, E903, E904, glucose syrup. Contains SOY and may contain traces of GLUTEN and other NUTS.